What procedure should one employ when trying to determine a chemical structure from an NMR spectrum? I have discussed a number of such examples in the past, most recently the procedure by Goodman for dealing with the situation where one has the experimental spectra of 2 diastereomers and you are trying to identify the structures of this pair.1 Now, Goodman provides an extension for the situation where you have a single experimental NMR spectrum and you are trying to determine which of a number of diasteromeric structures best accounts for this spectrum.2 Not only does this prescription provide a means for identifying the best structure, it also provides a confidence level. The method, called DP4, works as follows. First, perform an MM conformational search of every diastereomer. Select the conformations within 10 kJ of the global minimum and compute the 13C and 1H NMR chemical shifts at B3LYP/6->31G(d,p) – note no reoptimizations! Then compute the Boltzmann weighted average chemical shift. Scale these shifts against the experimental values. You’re now ready to apply the DP4 method. Compute the error in each chemical shift. Determine the probability of this error using the Student’s t test (with mean, standard deviation, and degrees of freedom as found using their database of over 1700 13C and over 1700 1H chemical shifts). Lastly, the DP4 probability is computed as the product of these probabilities divided by the sum of the product of the probabilities over all possible diastereomers. This process is not particularly difficult and Goodman provides a Java applet to perform the DP4 computation for you! In the paper Smith and Goodman demonstrate that in identifying structures for a broad range of natural products, the DP4 method does an outstanding job at identifying the correct diastereomer, and an even better job of not misidentifying a wrong structure to the spectrum. Performance is markedly better than the typical procedures used, like using the correlation coefficient or mean absolute error. 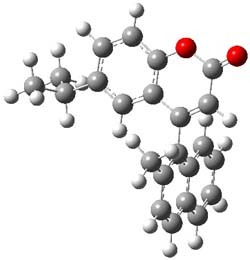 I would strongly encourage those people utilizing computed NMR spectra for identifying chemical structures to considering employing the DP4 method – the computational method is not particularly computer-intensive and the quality of the results is truly impressive. Afternote: David Bradley has a nice post on this paper, including some comments from Goodman. Somehow I missed this paper when it came out a few months ago, even though I was aware it was coming – as I mentioned it in one of my previous posts! Anyways, Schreiner and Allen reported on their third study of hydroxyl carbenes (see these posts on dihydroxymethylene and hydroxymethylene), this time examining phenylhydroxycarbene.1 As I covered in my book, there is a lot of work on phenylcarbenes which typically ring expand to the cycloheptatetraene, see Reaction 1. One might expect phenylhydroxycarbene to do the same thing, i.e. 1 converting into 2 (Reaction 2). 1 is prepared by high-vacuum flash pyrolysis of phenylglyoxylic acid 3 and then capturing the product in an argon matrix at 11 K (Reaction 3). The carbene 1 is identified through comparison of its experimental and computed (anharmonic frequencies at CCSD(T)/cc-pVDZ) IR frequencies. No ring expansion is observed at all – Reaction 2 does not occur. Instead, 1 rearranges to benzaldehyde 4 (Reaction 4) at 11 K with a half life of 2.46 h (and a half life of 2.55 h at 20 K). The deuterated analogue does not convert to benzaldehyde and 1-d appears to be completely stable. So, what is going on? The cis and trans forms of 1 interconvert through a barrier of 22.7 kcal mol-1. The trans isomer can convert to benzaldehyde (the reaction is very exothermic: -50.8 kcal mol-1) with a barrier of 28.8 kcal mol-1 through TS1, shown in Figure 1. The cis isomer can cleave into benzene and CO (not observed) with a huge barrier of 55 kcal mol-1. All of these barrier were computed at CCSD(T)/cc-pVQZ. Figure 1. MP2/cc-pVDZ optimized transition state for the conversion of 1 into 4. 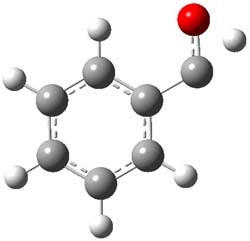 Benzaldehyde seems to be produced by passing through a huge barrier, something that is impossible from a thermal perspective (we’re at 11 K!). But this can be accomplished by tunneling. Tunneling probabilities were computed from the MP2/aug-cc-pVDZ intrinsic reaction path with barrier penetration integrals computed with the WKB approximation. The bottom line: the computed half-life is 3.3 h and the deuterated species is computed to have a half-life of 8700 years(! ), both in excellent agreement with experimental observation. Quantum mechanical tunneling is clearly the explanation for this chemistry. This is another fine example of the power of joint experimental/computational studies. And be on the look-out for an even more exciting case from this group. I met with Wes Allen on my recent trip to the University of Georgia and was entertained with another hydroxycarbene that undergoes quite novel tunneling! It’s been a while since I blogged about the use of computed spectra to determine the structure or configuration of a compound. Well, here’s a nice example of the use of computed electronic circular dichroism to determine the configuration of a coumarin that displays axial chirality. Mazzanti and coworkers have synthesized a series of coumarins,1 obtained their ECD and computed their structures, stero-interconversion barriers (at B3LYP/6-31G(d)) and ECD (at TD-DFT/B3LYP/6-311++G(2d,p)//B3LYP/6-31G(d)). I will mention explicitly here just one example, compound 1, which elutes off a chiral column in two mirror image forms, both of which do not stereomutate over time. The computed structure of 1 is shown in Figure 1 and the barrier for steromutation is predicted to be quite large, 35.7 kcal mol-1. This explains the lack of stereomutation. The computed ECD of 1M matches very well with the experimental ECD of the first eluted isomer, making the second eluted isomer 1P. The de novo design of catalysts for specific purposes remains an inspired goal for chemists and biochemists. 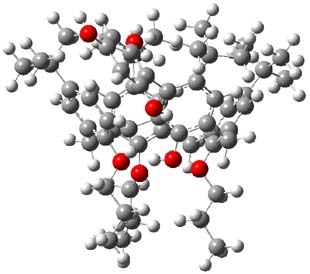 Ken Houk and David Baker have been pursuing this goal, and their recent paper on the design of a catalyst for the bimolecular Diels-Alder1 is a real significant step forward. Their model enzyme is one that will provide a hydrogen bond acceptor to the carbamate proton of 1 and a proton donor to the carbonyl oxygen of the amide 2. This model is sketched in Figure 1. Glutamine or asparagines will serve as the acceptor and serine, threonine, or tyrosine will serve as the proton donor. The catalytic site is then modeled, and then this active site is fit within 207 protein scaffolds. About 1019 active site configurations are reduced to about 106 possible protein scaffolds. Optimization of these led to 84 protein designs. in the Diels-Alder reaction of 1 + 2. Only 2 enzymes have activity, and with some protein modifications, quite reasonable enzyme activity is found. These enzymes show strong selectivity for the substrates – addition of a methyl group significantly diminishes catalytic activity. Perhaps most important is that of the 8 possible isomers that can be formed (4 isomers are produced in the uncatalyzed reaction) only 1 is produced here, the 3R,4S isomer 3. All-in-all, a quite remarkable accomplishment! "Computational Design of an Enzyme Catalyst for a Stereoselective Bimolecular Diels-Alder Reaction," Science, 2010, 329, 309-313, DOI: 10.1126/science.1190239. Determination of absolute configuration remains a difficult undertaking, one usually solved by x-ray crystallography. In my book (Chapter 1.6.3) and blog (see these posts) I have noted the use of computations in conjunction with optical rotation or electronic circular dichroism as an alternative: possible configurations are optimized and their optical properties are computed and then matched against experimental spectra. Computed optical rotations (TDDFT/B3LYP/6-31G* at 5 frequencies) are compared with experimental values in Table 1. While the magnitude is off (as is typical) the sign of the activity along with the trend matches up very well for the cS configuration shown in Figure 1. It should be noted that a second conformation makes up about 10% of the Boltzmann population, and the contribution of this second configuration is included in the computed values shown in Table 1. In addition, computations at higher levels give very similar results. Lastly, the computed ECD spectrum of the cS isomer also matches up well with experiment. Figure 1. B3LYP/6-31G* optimized structure of the major conformation of 1. Given the relatively low level of theory employed here, further use of this combined experimental/computational approach to obtaining absolute configurations of large molecules is encouraged.